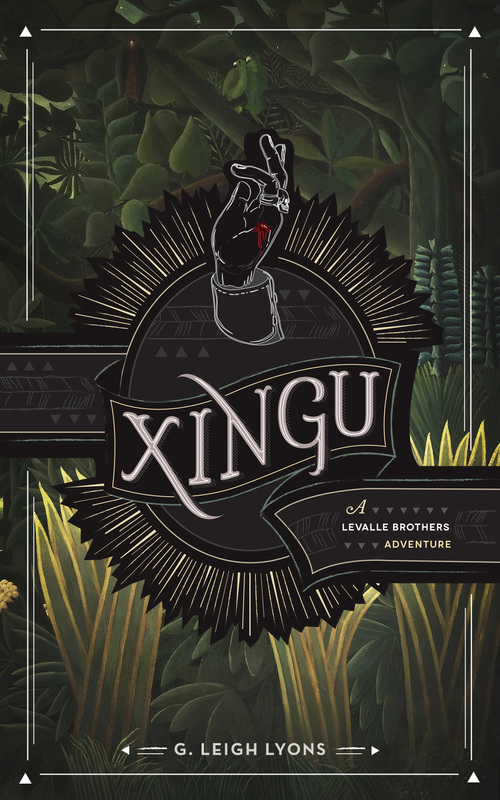 'XINGU - A Levalle Brothers Adventure', the first in a series, is scheduled to be released in January 2013. This amazing cover was done by the incredibly talented Catherine Renee Dimalla, designer and artist extraordinaire. Set in the late 1800‘s - a century and a half after Blackbeard’s time - Xingu tells the story of Charles and William Levalle, and their quest to rescue their sister from the clutches of a Brazilian pirate. Their parents, Raymond and Maria de Souza Levalle, were murdered on the tiny atoll of Cayo Perdido by Osvaldo Dos Santos and the crew of the Corcovado. For eighteen long years the man who Maria had left at the altar in favor of Raymond, had doggedly pursued the couple, single-minded in his vengeful purpose. The Levalles settled on Cayo Perdido and, secure in their isolation, fashioned a paradise for themselves and their children. It wouldn’t last long: in the summer of 1888, the pirate found them. Charles and William discovered the bodies of their parents as the Corcovado sailed away from the island. Through tears of grief they watched the ship disappear over the horizon. On board that terrible ship went the oldest of the Levalle children - their sister Gabriela. The boys survive, living alone on Cayo Perdido for four years, and on the very day of the fourth anniversary of the attack they receive a letter from Brazil and with it the news that the Corcovado had been spotted at the mouth of the Amazon River. It is on that day this story begins. Xingu chronicles their dangerous journey aboard the Oro Perdido to the Amazon basin and into the realm of the mysterious Xingu Indians. Along the way they encounter Captain O’Malley, Pierre, Old Four Fingers and Chang, a disgraced Shaolin monk. Former members of the Corcovado’s crew, they too are searching for Dos Santos for reasons of their own. The race is on. 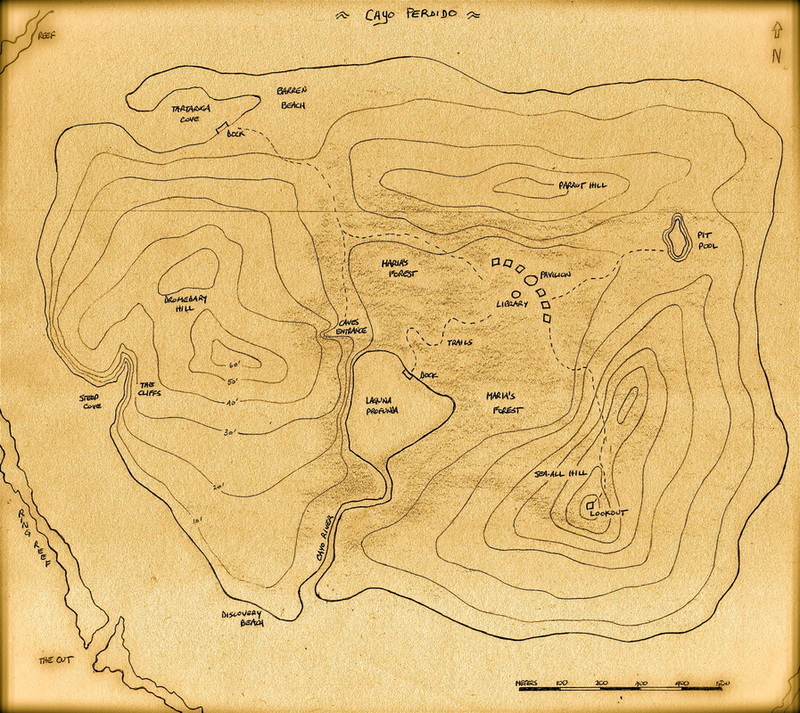 This is the map of Cayo Perdido, where the Levalles live. The parents were murdered on Discovery Beach. The reef rings the entire island - the only way to reach the island is through The Cut. Maria's Forest is a botanical paradise planted by the mother of the brothers. At the top of Sea-All Hill is The Lookout, where the Levalles parents are buried. From that vantage point one can see for miles in all directions. This black and white photo was taken by my wife, Jeanie. It is of a place we visited in the heart of the Amboro National Park called Mataracu. The scene could pass for the Levalles compound on Cayo Perdido or, to a lesser extent, the encampment of Osvaldo Dos Santos and his band of pirates near the Xingu River in the middle of the Amazon basin.